Fixed Blade With Cord Wrapped Handle | BUDK.com - Knives & Swords At The Lowest Prices! These knives are great for everyday tasks and for survival (to an extent), they came 6 days ago in which iv'e used them in the woods, and even carried the smaller one as my edc for a few days. 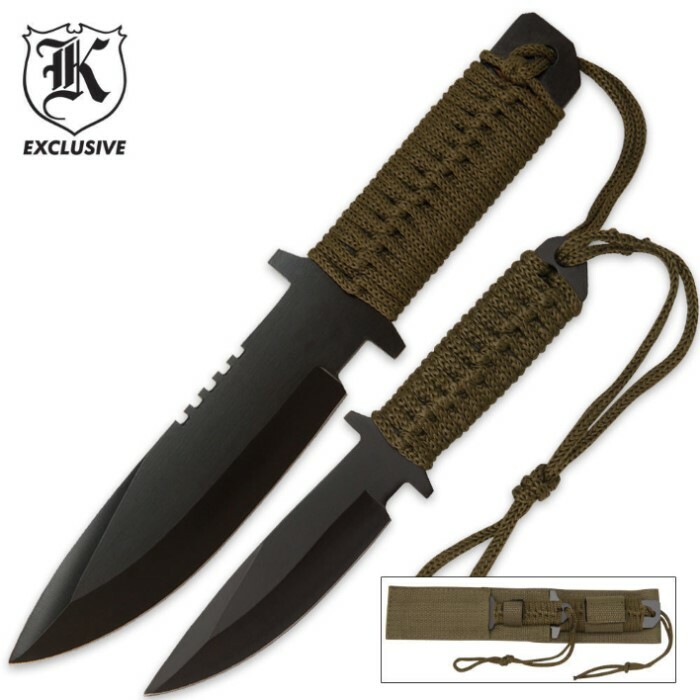 They came amazingly sharp, well enough to cut phone-book paper and almost anything you throw at it, and the bigger one is even good for battoning, they held an edge fairly well, and the only downside is the para-cord can become loose, but a simple tightening of the knot and its like new. I give these knives an A every time, this is definitely worth your money! The cord wrapped handles have a good hand feel. And the steel seems very strong. Not overly sharp out of the box but nothing a little time on the stone won't cure. While not being as sturdy as a 1/4 blade they did their job. Found for certain tasks they were better than using the bigger blade because they were lighter, they tired your arm less. Para-cord did fall off the large one after three chops to a small branch. Edge retained well for the beating I put on it. Easy and very fast to resharpen. Little one I only use with fire kit. Is a bit of a pain to get the big one out with its strap being right under the handle of the little one. Once you get used to it it is not really a problem tho. Nicer than I expected...2 for 1 means a great buy...strong thick blade...does not arrive sharp but not really a problem. Sheath seems nice but once sharp it is difficult to slip either knife in, especially with the serrated edge. Nylon snags or catches as mentioned in earlier review. Great for the cost. These are great back up knives! I put mine in my car, also travel with em sometimes! I bought these knives as a gift but I ended up gettinga buy one get one deal so I scored a set as well. So far I have been very impressed with these knives. I've killed a dove with the big one and skinned a rabbit with the small one and both worked fantastically. The only thing that I don't like is the paracord handles. For me they slide around and are not sturdy. As long as you keep these knives sharp and dry they will serve you well.